It was a windy day Sunday as a cold front moved down the coast. The west wind wrapped around the bluffs at Coal Oil Point, driving big wind waves and spraying sand along the beach. Aside from the ocean, this looks a lot like photos of the surface of Mars. 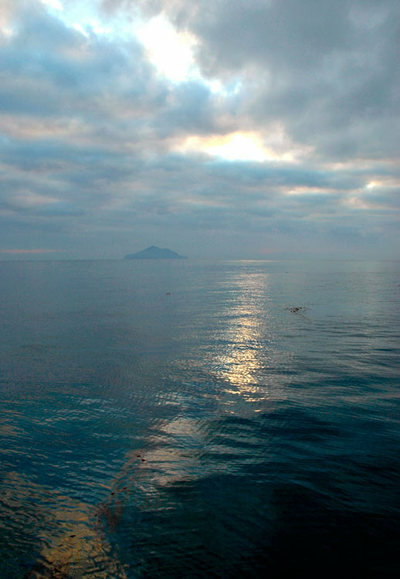 Anacapa Island at sunset, seen from a small plane on the hop from LAX to SBA. I always wish I could stop and get out, set up a tripod and try different angles. The ocean has been nearly flat lately, apparently the result of La Nina conditions, with a stationary high over the Northern Pacific blocking the storms that usually arrive in chains this time of year. And, it makes it particularly warm. The kelp seems to be doing well, too. 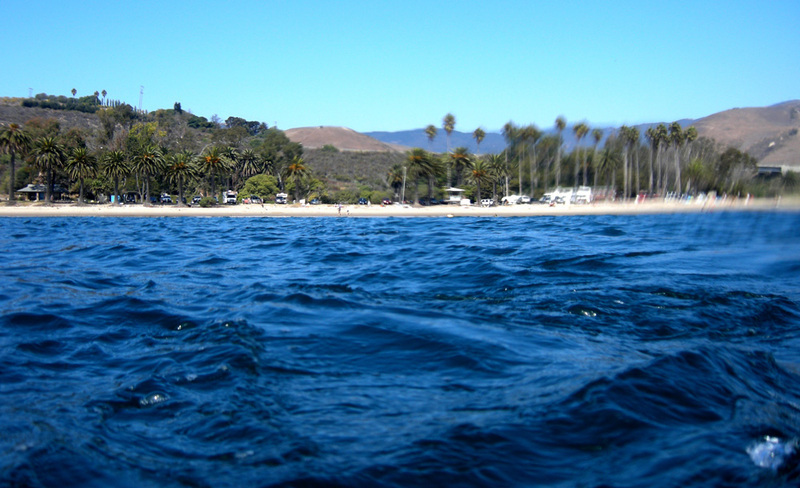 Refugio Beach, west side, seen from a couple hundred feet offshore. The view east along Becher's Bay at sunrise, from near the campground at Santa Cruz. At far left is Santa Cruz, separated from Santa Rosa by the Potato Patch, so-called perhaps because it is usually rough. It's also a good spot to see feeding whales, at certain times of year. The east end of Santa Rosa island is the trailing edge of land right of the Potato Patch. The good diving is south of that, behind the hills where the sun is rising. Arch Rock at Anacapa is one of the most recognizable features of California's Channel Islands. On a very clear day, it can be spotted from the 101 freeway north of Ventura. (Don't try this if you are the driver). Two parallel underwater arches line in reefs north and south of the abovewater arch. They are fun to dive, although when a lot of divers swim through them their bubbles dislodge a lot of material from the arch. On a very flat day I swam underneath this arch; it was quite a sight, stretching across Snell's window as if seen in a fisheye. I had no camera that day. 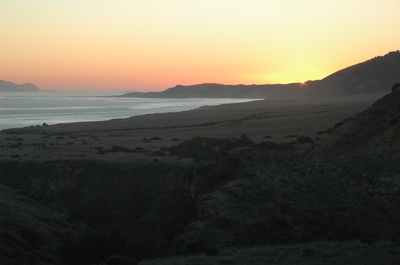 Sunrise from Yellow Banks, off the East end of Santa Cruz, looking toward Anacapa. 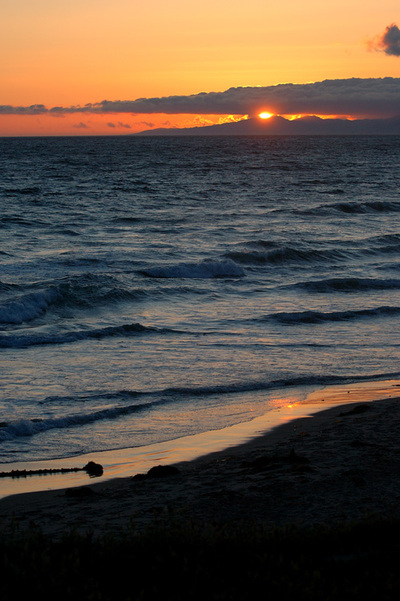 Sunset at Sands Beach in Goleta. This beach is nesting ground, and birthplace, for many snowy plovers. Big waves are rough on the kelp, like the kelp suspended inside this wave next to the break. These have been bombing in lately; nice for the surfers in spots. 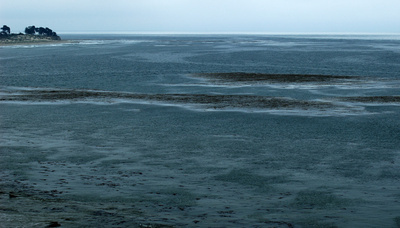 Here's the kelp at Sands Beach, as it appeared before the big waves. It's low tide in this view, of course. I've never dived here but I think it's very shallow and tends to be pretty murky. Lots of small creatures made their home in it -- I hope that they find a place to hide until the kelp grows back.